Democrats boycotted a meeting with President Trump on preventing a federal shutdown. 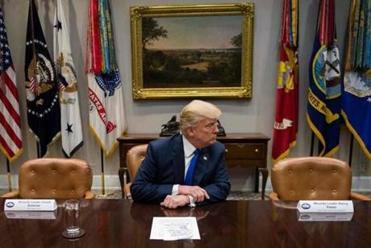 Senate leader Mitch McConnell and House Speaker Paul Ryan joined Trump. WASHINGTON — Senate Republicans took a significant step toward passing a sweeping tax overhaul on Tuesday, with a key panel giving its approval and several wavering senators indicating they would support the tax package, helping to clear the way for full Senate consideration later this week. The chances for the tax overhaul, which seemed uncertain on Monday, strengthened considerably on Tuesday after the Senate Budget Committee voted along party lines to advance the plan. 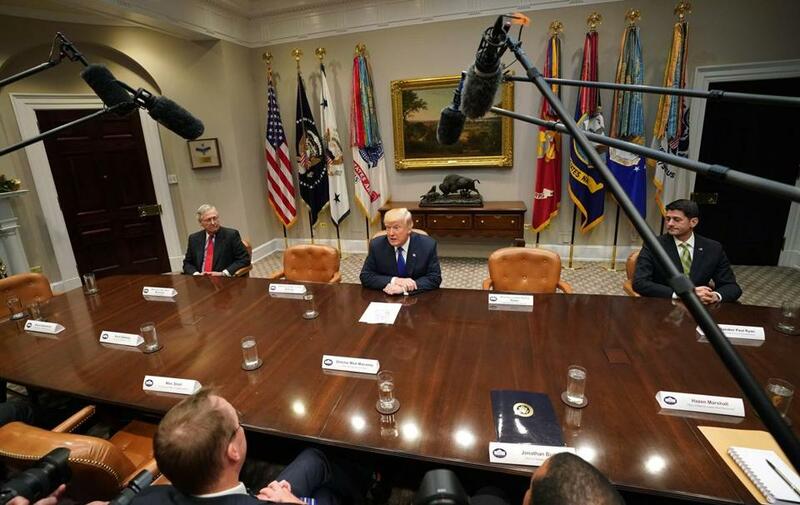 A flurry of last-minute dealmaking helped garner the support of a few Republican lawmakers who had expressed concerns about the $1.5 trillion package, including its treatment of small businesses and its effect on the deficit. The rapid turnaround underlines the pressure Republicans face to pass a tax cut and notch a significant legislative victory in their first year of controlling both Congress and the White House. To help push the effort forward, President Trump went to Capitol Hill Tuesday for a lunch meeting with Republican senators, where he made promises to some and admonished others. ‘‘It’s time to stop tweeting and start leading,’’ the Senate’s minority leader, Chuck Schumer, retorted after he and his House counterpart, Nancy Pelosi, rebuffed the meeting with Trump and top Republicans. Tuesday’s developments also emphasized the leverage Democrats have as Congress faces a deadline a week from Friday for passing separate legislation to keep federal agencies open while leaders seek a longer-term budget deal. Republicans lack the votes to pass the short-term legislation without Democratic support. A temporary spending bill expires Dec. 8. Hurricane aid for Texas, Florida, Puerto Rico, and the Virgin Islands is expected to be included in that measure, as well as renewed financing for a health program that serves 8 million low-income children. Democrats are also pressing for protections for immigrants brought to the United States as children. As for the tax bill, Republicans emerged from the lunch increasingly optimistic about that bill’s fate and playing down the concerns that had threatened to bedevil its passage. Three key Republican senators who were holdouts, Susan Collins of Maine, Bob Corker of Tennessee, and Ron Johnson of Wisconsin, sounded positive about the bill after gaining assurances from Trump and Republican leaders that their worries would be addressed. Several hurdles remained, however, including resolving differences with the House version of the tax bill, which differs in significant ways from the Senate’s. Both bills would cut taxes on businesses and individuals, but differ in the scope and timing. The Senate bill would cut the corporate tax rate to 20 percent from a top rate of 35 percent. For individuals, it would make tax cuts temporary and create seven income tax brackets, with a bottom rate of 10 percent and a top marginal rate of 38.5 percent, down from the current 39.6 percent. Lawmakers are also awaiting a report from the Joint Committee on Taxation that would show the effects of the proposed tax cuts on the economy. That analysis will indicate the extent to which cuts would bolster growth and avoid enlarging the deficit. Outside analysts expect the assessment to demonstrate the Senate bill would not create nearly enough growth to generate revenues to offset those lost via tax cuts, undermining Republican claims the bill would pay for itself. Corker, who has voiced the loudest concerns about the bill’s effect on the deficit, said Tuesday that he had received assurances the final legislation would include a mechanism to avoid ballooning the debt, which has passed $20 trillion. “I think we’ve come to a pretty acceptable place, from my standpoint,” said Corker. Johnson objected to the bill on the grounds it would not do enough to help “pass-through” businesses, which pass their income on to their owners. During lunch with Trump, the president chastised Johnson over objections he raised, saying at one point, “Come on, Ron,” according to a person familiar with the discussion who declined to be identified. Other Republican senators who have been skeptical of the tax bill also appeared ready to back it. Collins said she felt more optimistic after meeting with the president. She said the president was supportive of her wishes that $10,000 of property taxes be deductible under the Senate plan, a change that would be similar to the compromise House Republicans made. She also said that Trump was supportive of legislation to help stabilize health insurance markets, which she said would help mitigate the effects of ending the law’s requirement that most people have insurance, as the tax bill would do.